Black cabs which are over ten years old are to be banned from Birmingham Airport - leaving dozens of drivers facing £40,000 payouts. Taxi management company Airport Ranks has warned 300 cabbies they must replace all vehicles of ten years or more or risk being banned from the complex. 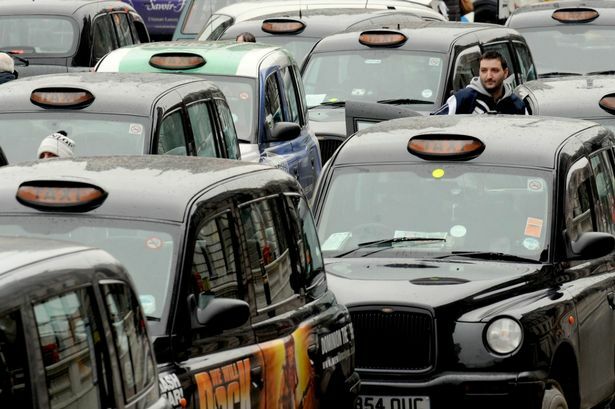 Angry drivers say between 30 and 40 vehicles will have to be replaced but many older cabbies are unwilling to fork out up to £40,000 for new black cabs. One driver, who asked not to be named, said: "Cab drivers are being bullied into buying new cabs, otherwise they will be thrown off the airport rank. "The management company has said it is reviewing the licences from June 1 and it has put up a notice on the airport site to say everybody with a cab over ten years old will no longer be allowed on the rank. You have to pay your money, which is more than £1,000, by June 1. "It is disgusting people only have until then to say whether they are going to replace their vehicles. "Some of the drivers have been at the airport for 20 years or more and those who are nearing retirement age do not want to buy new vehicles." Retired West Midland car executive Barrie Wills, who worked for Jaguar, Reliant and British Leyland, said he was "staggered" by the ban. "I arrived at Birmingham Airport from Belfast on Tuesday evening to take a cab home," he said. "I made my now regular private protest by taking, much to the disgust of the drivers, the fifth cab in line - an iconic black cab - rather than one of the four converted, goods-carrying commercial vans which nowadays pose as taxis. "As I was settling into the comfort of the rear seat, to my utter horror and astonishment, I was told by the driver this very day had brought about a decision that no cab over ten years old would be allowed to operate from the airport. "The black taxi is world-renowned. They are wonderful vehicles which last forever - why the hell should they be forced off the road?" A spokesperson for Airport Ranks said: "This is not a new decision and is a condition that drivers sign up to when agreeing to work at the airport. "It has been in place for many many years and is to ensure that the condition of the vehicles meet the expected standards."